The Vuelta a España begins on Saturday. Like last year, it opens with a short and sweet Team Time Trial – 13.5 kilometers through Benidorm. This opening TTT is not where the race can be won, but it can be lost for a GC contender if his team’s performance puts him behind the 8-ball too early. Like last year, we can expect HTC to open their account early and win it. They’ll like if Cavendish can win a stage while wearing the leader’s jersey. Of course, they won’t have it easy, as GC teams will be looking to put time into each other over even the short course. 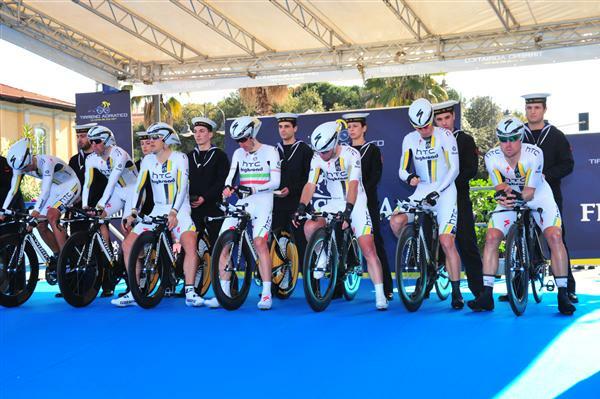 Liquigas would love to be on top again, but this year’s squad doesn’t look as strong in the Team Time Trial as last year’s – even with Peter Sagan’s presence – due to Roman Kreuziger’s absence. On the hot seat in the Team Time Trial is Katusha, who is ostensibly supporting Joaquim Rodriguez’s GC ambitions. Last year they finished mid-pack in the team time trial, but given their luck this year, Andre Tchmil may have to be riding alongside his hapless flock with spare bikes on his hunched shoulders. Stage 2, on Sunday, can safely be considered one for the sprinters, many of whom are here to prepare for a flat World Championship course in Denmark in late September. While Cavendish looks like the top sprinter in the world, his recent media-teasing regarding HTC may weaken his concentration and uphold his tradition of needing a few stages to properly warm up for the sprints. Maybe we’ll see a re-run of the 2010 Tour, then, with Lampre’s Alessandro Petacchi grabbing an early win. However, it’s his third GT of the year – he must be tired by now. We lean toward Garmin-Cervelo’s Tyler Farrar for Stage 2, but young flaming hot Marcel Kittel of Skil-Shimano or even Peter Sagan might come out on top. This entry was posted in Featured, Races and tagged Cavendish, htc, liquigas, sprints, team time trial, vuelta, weekend preview. Bookmark the permalink.